Tours and Activities - Discover Victoria BC, International city of adventure. Victoria is a city as unique as they come. Naturally, it is home to a number of tours and activities that are unlike those you’ll find anywhere else. There’s plenty of stunning scenery abound, a rich history to the streets and buildings and numerous sites to see on top of a bustling culture. With 3.5 million people coming to visit, there is something for everyone to get to explore the city. Water Taxi Rides: Seeing the harbour and buildings of Victoria from the water is a great way to get a new vantage point on the city. Besides just linking a couple of different ports, you can snag a 45 minute tour in a Water Taxi that is incredibly scenic and also gives you the low-down on important landmarks, First Nations territory/history, and sea life. Carriage Rides: Nothing evokes the historical vibe of the city more than a leisurely carriage ride. Take your time to see the landmarks and buildings to the rhythm of your private carriage with a knowledgeable guide and the soft patter of horses’ hooves. It can also make for a romantic start to an evening out. Pedicabs: Like a modern-city take of the rickshaw, Pedicabs take advantage of the fact that Victoria is the cycling capital of Canada. Due to the convenient size of these man-powered carriages, the access granted by a tour reaches far beyond those of other tour vehicles. Lead and powered by a knowledgeable local guide, a Pedicab tour lets you experience the city by bike, but without all the pedaling. Walking Tours: Seeing the city by foot is a fantastic way to make sure you take the time to really see it all. Themed or geared towards just learning the basics about the city, there are numerous options to choose from in Victoria. There are even ghost tours at night for those more unsightly aspects of Victoria’s rich history. Food Tours: For those who love to eat, there’s no better city to do it than Victoria. Boasting one of the highest restaurants per capita in North America, Victoria also lays claim to the title of the Brunch Capital of Canada. Local goods, fresh eats, amazing seafood and plenty of artisan munchies can be found here – both in grocery stores and at the farmer’s markets. With so many choices, it’s nearly impossible to pick where to eat. Luckily, there’s a tour for that. Sometimes, the best way to discover a city is through its food. Brewery/Distillery/Winery Tours: Never one to miss out on a party, Victoria was quick to hop on the microbrewery train as it took off across North America. More than that though, there is a number of craft distilleries as well. On the wine side of things, the Saanich Peninsula proved worthy of growing luscious grapes, perfect for the production of local wines. 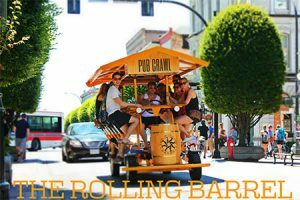 Multiple Tour options exist from hop-on/hop-off brew buses, walking tours, bus tours and even SUP Tours. Sip the city – it is, after all, B.C.’s craft beer capital as well. Bus Tours: Bus tours are a fantastic option to see the sights from far and wide across the city in one go. Double decker, hop-on/hop-off, guided or purely transportation, the options to see Victoria by bus are vast. Those determined to see it all, or who are short on time can rest assured they’ve covered all of Victoria. Garden Tours: A temperate climate year-round with a next-to-non-existent winter has lead to Victoria’s pleasant nickname: The Garden City. There are plenty of emerald oases in the city to see, so a garden tour is a viable option. Besides the infamous Butchart Gardens, you’ll be let in on the secret of numerous other gems, while visiting different areas of the city. Bike Tours: Cycling the day away may just be one of the most satisfying ways to see a city. As the cycling capital of Canada, seeing Victoria by bike tour is a safe, enjoyable and efficient way to visit the top sights without spending half of a beautiful day stuck inside a bus or car. Food tours, brew tours, historical tours or scenic tours— there’s nearly any kind of bike tour imaginable available in Victoria. Scenic Flights: The bird’s eye view is a refreshing overview of British Columbia’s capital city. Take off and land in the iconic Inner Harbour and see all the sights from above to map out the rest of your time in the city. The panoramic views are stunning and a flight is a unique way to take it all in with a single glance. Parliament Tours: Although just a single aspect of Victoria, the B.C. Legislative Buildings might be the most important. Tours of these eminent buildings are free and only 30-minutes long. Get a glimpse inside Victoria’s legacy as British Columbia’s capital city. You’ll learn about Canada’s government and Victoria’s history, as well as be able to explore sections of the stunning, architectural achievements. Unique Activities: Thanks to its coastal location, Victoria already has more than its fair share of unique activities. However, the city is incredibly dynamic and so, aside from your seaside expeditions, there are plenty of ways to try something new. Once you start looking, you’ll be amazed at all the different kinds of ways there are to experience life and have fun in Victoria. 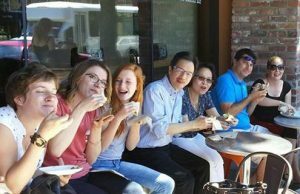 Join us on a delicious food tour to explore the history and cuisine of Victoria. Whether it’s craft beer or locally grown produce, our tours are a tasty way to explore our beautiful city and learn about our unique culinary culture. We sip and sample our way through interesting neighbourhoods such as Fort Street, Old Town, and the Victoria Public Market with a local guide who will provide stories, history, and insider tips on the best hidden gems in the city! A great opportunity to meet the local chefs and pick-up a souvenir for your foodie friends back at home. Trapped Victoria, is a 5D real-life escape room gaming facility. Players are challenged to display their intelligence, marvels, and artistry by outwitting the Game Master, by solving challenging puzzles, discovering exciting clues, and escaping within 60 minutes. 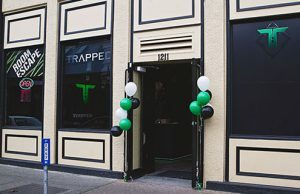 Trapped’s escape rooms offer varying levels of difficulty, so those who are both new to escape games and the most experienced can have fun. Trapped provides year-round entertainment, where people can experience the hottest new trend in Date Nights, Family Fun and Corporate Team-Building. Trapped Victoria is located at 1211 Wharf Street in the heart of Victoria’s downtown tourist district, beside Bastion Square, and is easily accessible by car and public transit with street parking free after 6pm and free on Sundays.